Key to the success of quality implementation is the understandingteam members have of the process and the tools to be used. Continual Improvement in Government: Tools and Methods was designed to provide users with a complete description and practical examples of these tools and viable techniques that will benefit teams. This book examines the four most popular tools: flowcharting; cause and effect diagrams; Pareto charts; and histograms-and shows how to apply them in the public service sector.To improve processes requires effective decision-making and effective decision-making begins with accurate data. Koehler and Pankowski dispel the myths and fears of data collection and analysis. In a step-by-step approach, they lead you through the very heart of Quality Management…DATA. 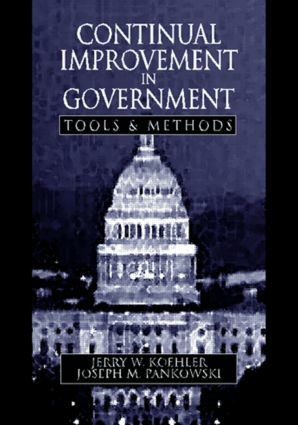 Continual Improvement in Government: Tools and Methods provides an understandable format that explains the importance of data, the differences in the quality of data, why it is collected, and how it is used.